South Lake Tahoe 3-BR Waterfront Beauty! Take a look at this fabulous home located in the Tahoe Keys with your own private boat dock. This remodeled beauty is perfect for families and groups with sleeping for 9 people, gorgeous kitchen with all new appliances, knotty pine ceiling and cabinets, beautiful river rock gas burning fireplace, fantastic deck sitting over the channel, and jacuzzi bath tub! This unique home is landscaped in the summer time for yard play with the kids, has new leather sofas in the living room, and has access to all the Tahoe Keys Amenities such as tennis courts, pool area, private beach, and basketball courts. (For a small daily fee) The home also allows pets with an additional $300 deposit. 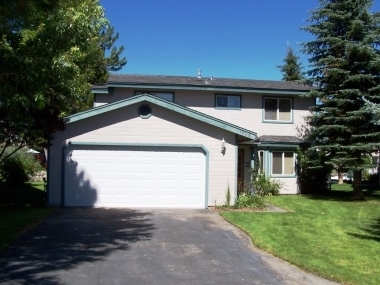 Come and enjoy beautiful Lake Tahoe anytime of year in this perfect home! Please note: This home does require a 5 night minimum stay throughout the summer. Please call to check availability.